Redeemer has added a new easy way to give. 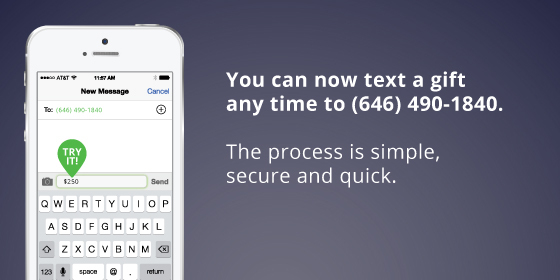 You can now text a gift any time to (646) 490-1840. Simply type in the amount you wish to give, "10", "20", "100" etc. and if it's the first time, you will be asked to register. The process is simple, secure and you do not incur a fee. For future giving, save the number to your mobile device or access it through the Redeemer App under "Give".